This post is based on a talk I gave at Vancouver Island University’s “DH Innovations: Lab Based Environments in the Humanities” conference in late May. The full title of the talk was “Portable, Tacit, Temporary: Popup Makerspaces in the Humanities,” and during that talk I read aloud a portion of what’s below. I want to thank the VIU@Cowichan Innovation Lab, the Humanities Interdisciplinarity Research Group, Sally Carpentier, and Richard J. Lane for organizing the event, where Ray Siemens was the keynote speaker. Today, at this conference about humanities labs for research and learning, I want to start with a video about makerspaces. It was produced by Nina Belojevic, Arthur Hain, Shaun Macpherson, Katie Tanigawa, and the Maker Lab team at the University of Victoria. One of the reasons I enjoy this video is the rather amusing way it hyperbolizes the everyday spaces where many humanities scholars hold court for populations of one. Adorned in this case with a stockpile of carbs and an attentive iPhone, the theme is familiar: isolation, individuation, fluorescent lighting, library carrels, Microsoft Word, songs with no vocals, armchairs worn by reading, and “where to start?” all comprise the life of the mind, which, as Bill Brown suggests, “has a materiality of its own.” Without a doubt, aspects of this lifestyle appeal to many scholars, at least when you peel back the hyperbole. It is a lifestyle that appears conducive to concentrated research and sole-authored essays. It is disciplined. It is focused. And yet many among us (perhaps sympathizing with Shaun Macpherson in the video) want to combine our solitary research routines and their corresponding environments with collaborative climates and collective practice—as long, of course, as our mobile phones can tag along, too. After all, Shaun’s iPhone constantly reminds us that no academic space transcends the all-embracing reach of homogeneous, empty time. Still, the video suggests that time flies in makerspaces. After our protagonist is rescued by the Digital Humanities Summer Institute and its “Hello World” workshop series, social activities and upbeat experiments abound. Shaun constructs 3D models, builds circuits, authors exhibits, attends workshops, shares research in progress, and chats with really clever people. To boot, the canned music now has a vocal track, and the workstations are intended for group sizes two and up. Now, any of you at all familiar with labs or makerspaces will cry, “Shenanigans.” And those of us in the Maker Lab will confess. Our video gives you the everyday of an individuated humanities scholar while bypassing the everyday of makerspaces. We indeed cut out our middle state. You will highlight how this becomes that in makerspaces, where the 3D printer often breaks, the models are rarely watertight, the circuits are always delicate, the server is under maintenance, no one wants to calibrate the machine, and the LED hasn’t blinked for an hour. Where technologies are concerned, there is certainly no shortage of glitch. And where important decisions are necessary, there’s no lack of frustration, either. 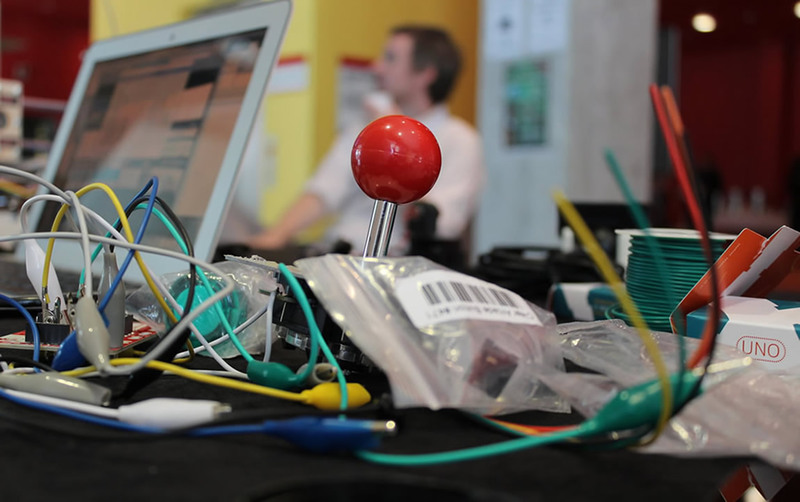 Borrowing for a moment from Bill Turkel: “The things that we have to figure out don’t come in neat packages.” But the thing is, in a makerspace the glitches and frustrations are often out in the open. As environments for learning and research, they foreground the material character of technocultural relations. In them you will find dead media, bent commodities, and boxes brimming with discards and disappointments. Today, my question is how to take such spaces on the road, or how to highlight the ways in which they are portable, tacit, temporary. For the next few minutes, then, I want to explore the phenomena of popup makerspaces, anchoring them in a recent Maker Lab experiment, where—in collaboration with the Ontario Augmented Realty Network and the Lab for Humanistic Fabrication at Western University—we grafted a makerspace onto the annual HASTAC conference, held this year, in April, at York University. Importantly, I am not suggesting that the Maker Lab invented popup makerspaces or, say, prefabricated labs. For instance, you might consider the portable, modular, and versatile research shelters used in places like Antarctica. 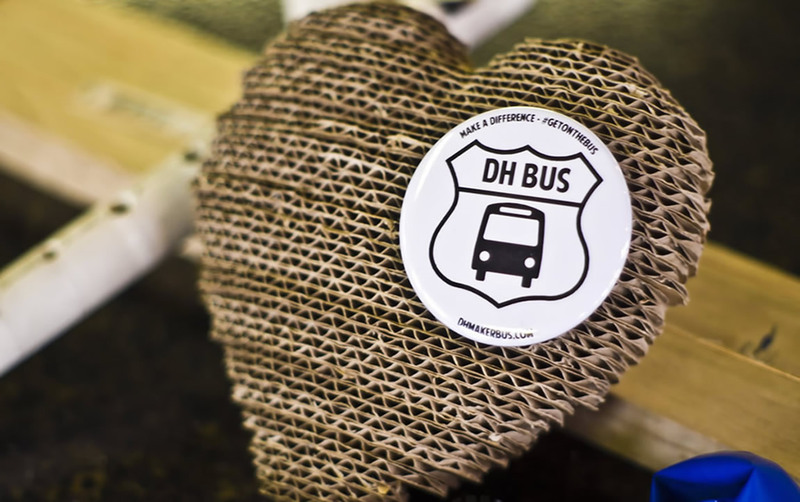 Or you might consider the recently launched DHMakerBus initiative, based at Western, that is encouraging digital humanities practitioners to get on the bus and travel with their research and materials. In this case, the MakerBus group is venturing to Lincoln, Nebraska for the annual Digital Humanities conference. 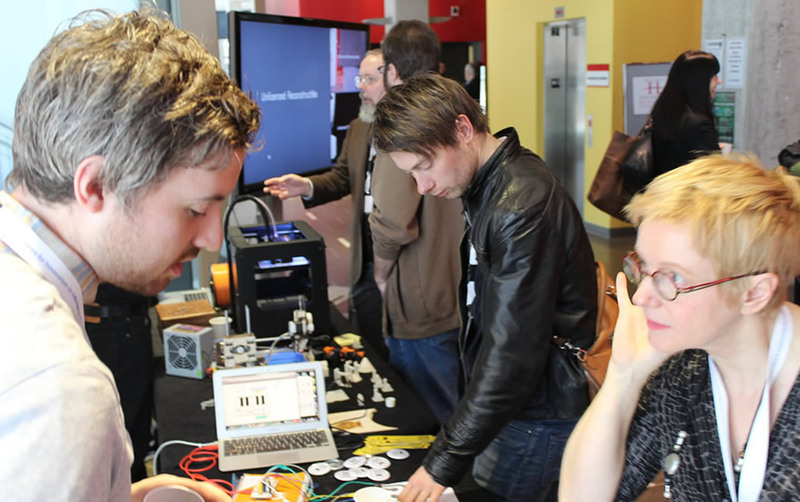 And finally, here on Vancouver Island, you might consider the array of community-based activities sparked by groups like the Victoria Makerspace, the Makehouse on Fort, Limbic Media, and the G++ Gallery. 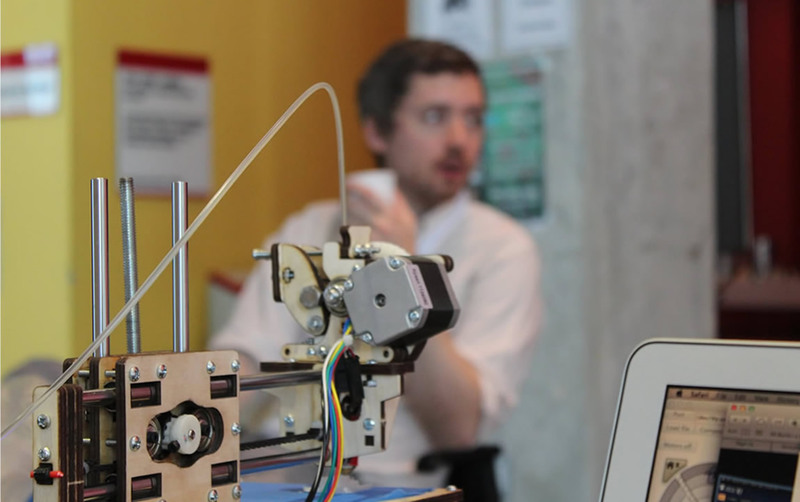 One of the first key premises of popup makerspaces is that their infrastructure is flexible and portable. In our case at HASTAC 2013, Devon Elliott brought a majority of our materials to York’s campus. Our setup time for this particular popup was less than 45 minutes, and with practice we could reduce that time to, say, 20 or 30 minutes. The popup materials—comprised largely of component parts—fit in a few relatively small crates, which we could carry from a university parking lot into the conference space. For example, this Printrbot jr (above) can be broken down, transplanted to a new context, and then reassembled to make small prints on most any desktop. 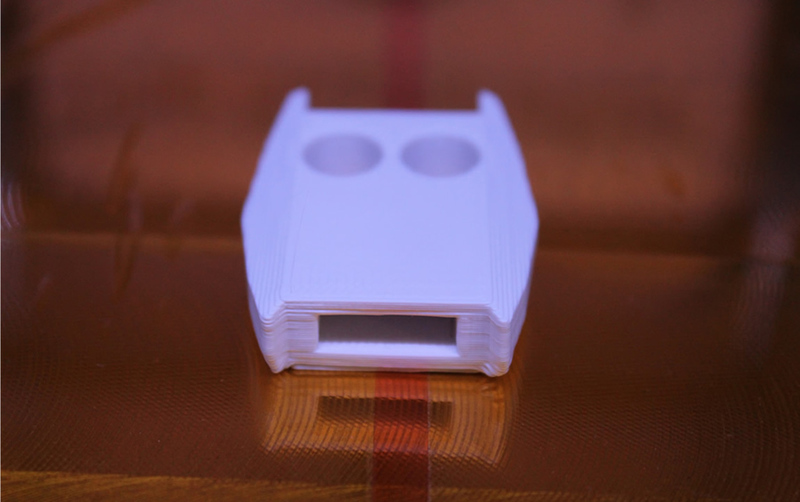 Of course, many popup parts (Printrbot parts included) are small and often glitchy. When transferring these supplies from one location to the next, some of them will inevitably get lost, too. Nevertheless, they tend to be affordable or low-cost, especially where physical computing is concerned. 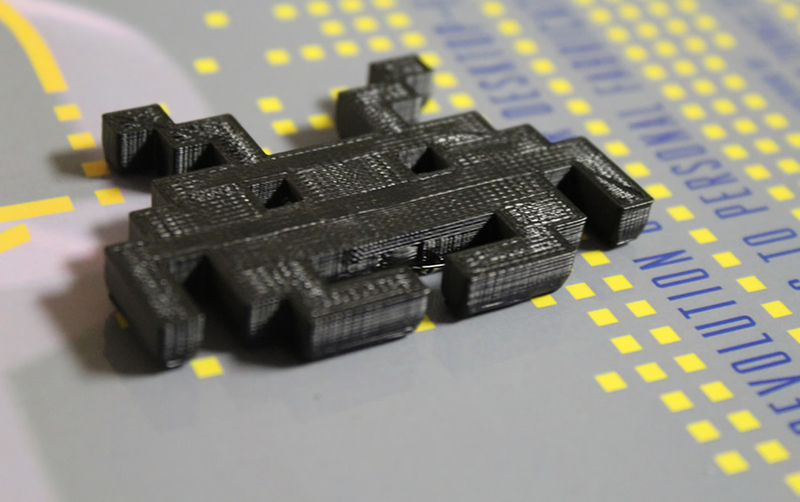 Comparable to many desktop fabrication technologies, builds in physical computing are intended to be small and easy to transfer. Yet perhaps more importantly, the portability of these materials helps practitioners generalize research practices beyond their campuses. By “generalize,” I specifically mean unpacking not only what changes from setting to setting but also what persists. Which questions gain traction across communities? What tends to interest a variety of people? What concerns or criticisms are common? This emphasis on difference in tandem with persistence allows us to take seriously the cultural assumptions and habits that congeal in our humanities labs and infrastructures. For instance, one pressing concern in humanities physical computing and fabrication is how to foster positive force environments that do not exclude people (especially people who are traditionally under-represented in technology-inflected fields) through their rhetorics, affordances, ideological orientations, infrastructures, and social relations. Here, work by the Fembot Collective, HASTAC, and #TransformDH (among others) is crucial. It helps that many popup makerspaces experiment with curiosities often fabricated on the fly. These small, printed objects encourage tacit engagement with the materials at hand, and they also help generate a critical atmosphere that builds up from the familiar, the popular, the experimental, the playful. Theory meets hobbyism halfway. 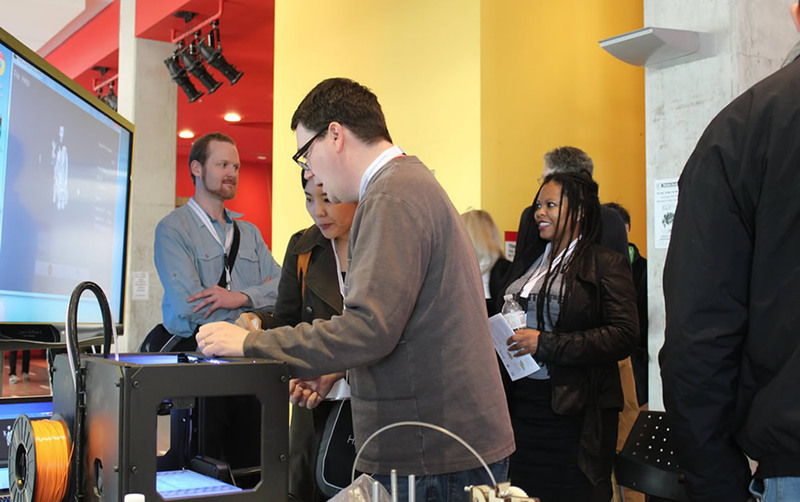 Our conversations at HASTAC 2013 frequently started with current problems around 3D printing and its perceived limitations, including its potential to produce waste, WYSIWYG manufacturing, and further commodify craft making. Yet those discussions ultimately underscored the need for intervention and active engagement at the level of practice. 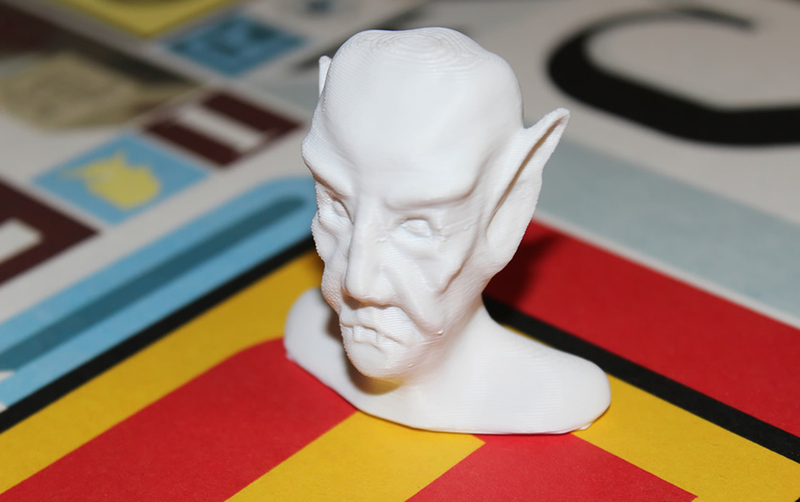 What should media historians, gamers, and archaeologists be printing? What materials are eco-friendly or biodegradable? 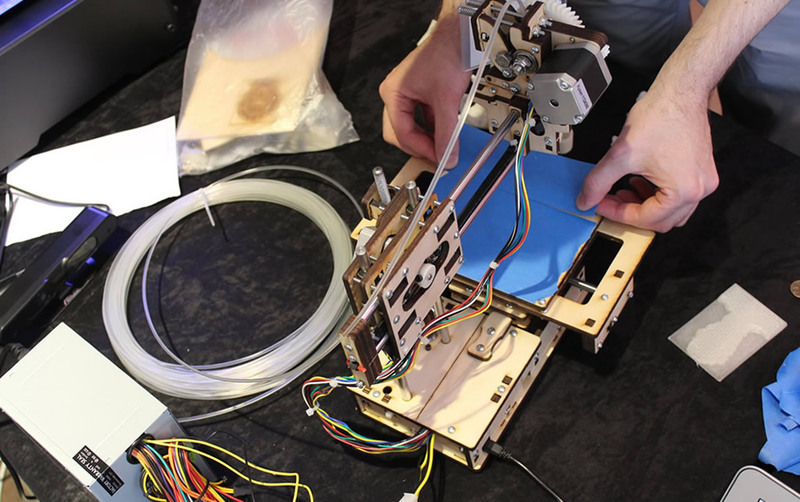 With technologies like Printrbots, how might we make stuff that does not yet exist in the physical world? 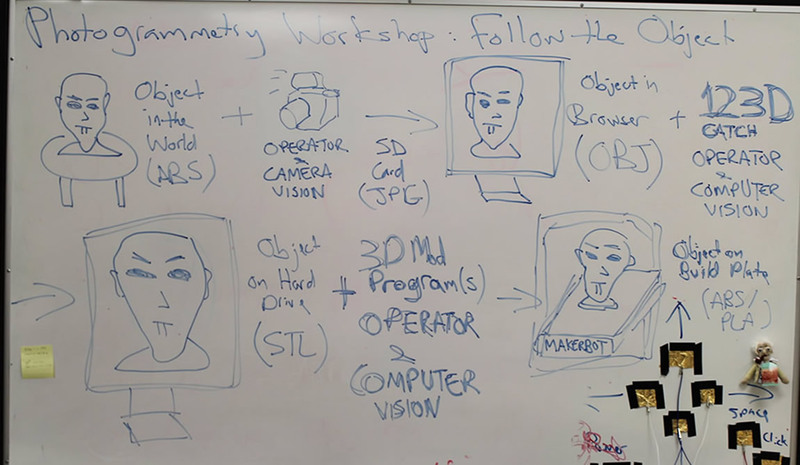 How might humanities practitioners contribute to popular repositories of 3D models and, more generally, to the Internet of Things? And rather than assuming we can do this work alone, how might we distribute expertise across communities like HASTAC and then build accordingly? As these questions suggest, popup makerspaces resemble unconferences in the way that they can facilitate conversations, promote hacking, and encourage new partnerships across disciplines. That said, we might also imagine popup makerspaces as vehicles for partnerships in practice, by which I mean collaborations organized around common concerns, interests, and methods. Resonating with the work of Star and Griesemer, popups give us a temporary place to think with and through “boundary objects” that simultaneously afford different, local interpretations and shared, collective uses. This combination of what’s shared and what’s different can allow practitioners to identify robust lines of inquiry relevant to contemporary culture: emerging forms of manufacturing and labor in a digital economy, social justice initiatives steeped in critical making, GLAM institutions as “intelligent environments,” questions of copyright and privacy around the Internet of Things, and the speculative design of new books, objects, and forms of scholarly communication. All of these issues require complex articulations of knowing by doing, or—echoing Fiona Barnett and HASTAC at large—practice-based orientations where difference is our operating system. One question, then, is what kind of infrastructure enables or subtends such a system. If we start with the claim that all technologies are culturally embedded and steeped in social relations, then—as humanities practitioners—we might put a little more pressure on the assumptions motivating (or motivated by) the current climate of information saturation, rapid data transfer, social networking, and ubiquitous attention to screens. Thus far, a popular response to this climate has been big data research, which is no doubt exciting for those of us in the humanities and beyond. Many researchers, including a significant number of HASTAC members, are learning a lot from big data approaches to history, political economy, literature, and aesthetics. And, methodologically speaking, big data in the humanities is interesting and vital because it demands thinking at scale, with information that is incredibly messy and difficult (if not impossible) to classify. Yet thinking at scale can go in the other direction, too. That is, we might combine big data or large-scale computing with minimal or small-scale computing, which—in the case of popup makerspaces—asks us to consider (at least) the following: What technologies do we absolutely need in order to persuasively engage the issue or context at hand? How do technologies and data transfer from setting to setting, and through what worldviews? When do they not transfer, and why? How can “thinking small” brush against planned obsolescence, the proliferation of e-waste, and screen essentialism? 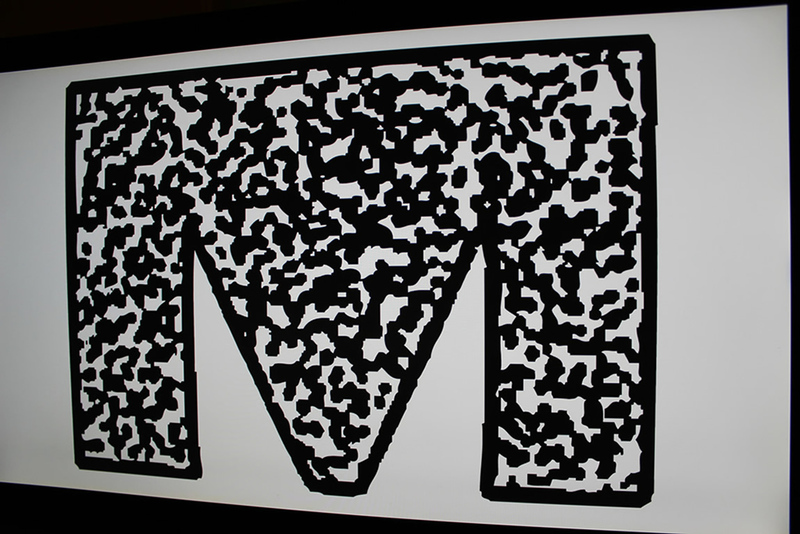 When can “minimal” still imply “messy” (rather than “elegant” or “friction-free”)? How might digital humanities scholars conduct research in analog, or with “dead” and ostensibly lo-fi media? 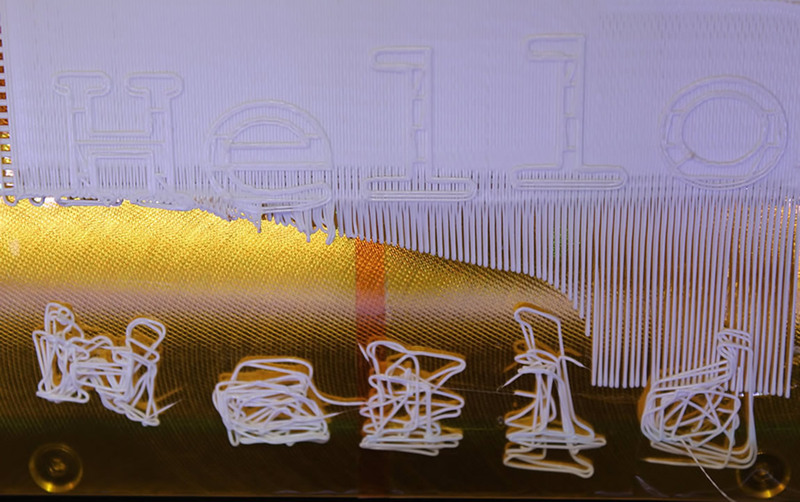 Finally, how can miniaturization become a paradigm for critical making? And to what effects on research practices, socioeconomic relations, and “big thinking”? 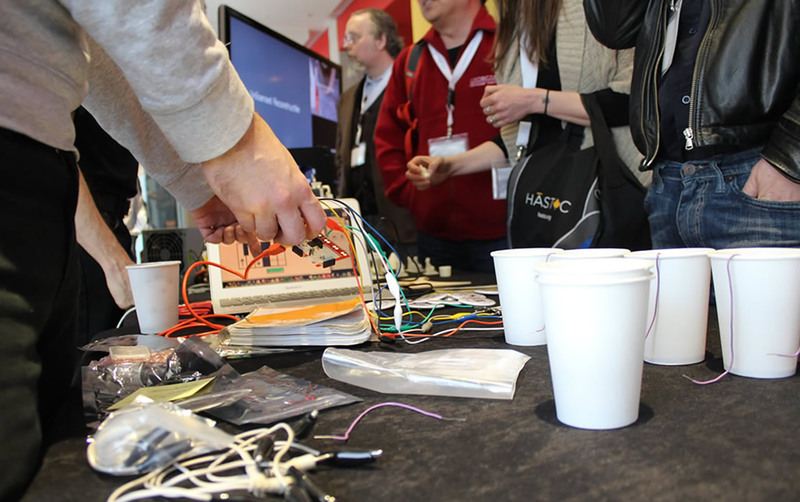 During the next few years, the Maker Lab team—in collaboration with our colleagues at HASTAC and GO::DH—will be addressing these very questions and whatever else unfolds in the process. For now, we want to thank you for your time. Post by Jentery Sayers, attached to the Makerspace, BuildingPH, and HelloWorld projects, with the fabrication and physcomp tags. All featured images for this post care of Jentery Sayers, with the exception of the DHMakerBus image, which is care of “Making at the Market” at dhmakerbus.com.